We want our Santa Cruz patients to know that root canals are tiny passageways that branch off from beneath the top of the tooth, coursing their way vertically downward, until they reach the tip of the root. 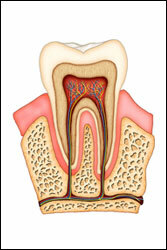 All teeth have between one and four root canals. Most Santa Cruz patients who have root canal experience little or no discomfort or pain, and enjoy a restored tooth that can last almost as long as its healthy original. For more information on Root Canal Therapy in Santa Cruz, CA call E. John Baron, DDS INC. at (831) 426-9200 today!